Summer is here and it's time to wear swimwear every day. So, get your fitness and water sports apparel on first! From the wonderful company that made my rainbow rash guard, I bring you active-wear by Platinum Sun. As I've mentioned before, I really love everything about this passionate brand (search "I'm Going Platinum.") 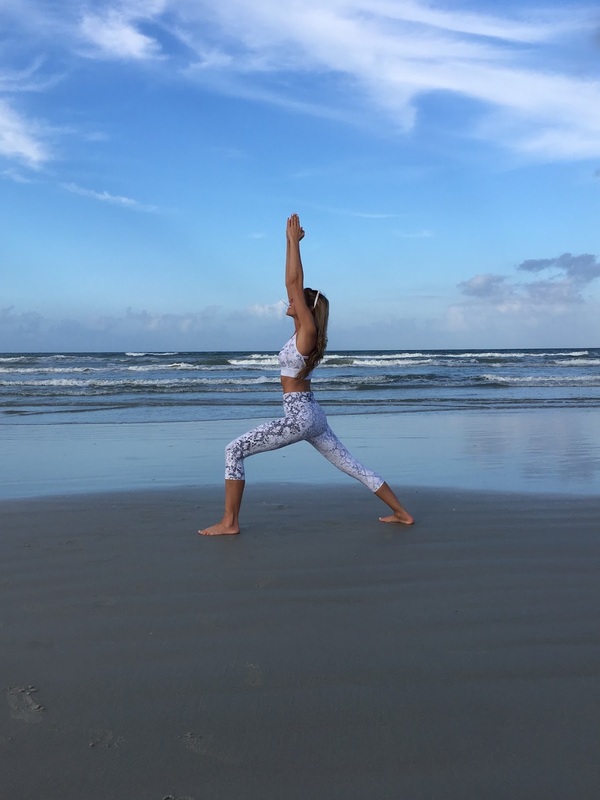 You can see by the picture I put at the top that I feel like a true warrior doing the yoga warrior pose on the beach in my new snakeskin sports bra and capri leggings. All of my Platinum Sun active wear seen here has ergonomic fit. What does that mean? It's a contoured fit that provides flexibility and increases flow of oxygen to your muscles while working out for that bikini body. The quick-drying, antibacterial fabric keeps you cool and dry. I enjoy wearing Platinum Sun clothing because they are comfortable with a wide waistband, fitted, soft and thick. Not only does the fabric look cool, it keeps you cool too. You can be sure the colors will not fade too because all items are made to withstand abuse from saltwater, chlorinated pools and repeated use of laundry detergent (after your intense workouts.) I'm also loving wearing active wear with flatlock seams. Plus, the front and back of the sports-bra is pretty stylish. Now, how about those black leggings? These are high-performace leggings perfect for a workout, surfing, kite surfing or any watersports activity. They will keep you warm and you will be protected with a UPF of 50+. These "oil print" compression leggings have all the benefits I mentioned above and more. Compression leggings create blood circulation, draw moisture away from your body and reduce soreness. It's a sportswear craze with research to back it up. Get them in black from Platinum Sun and you'll not only feel fit but you will look fit, too. I really wanted them because I like that they can be worn day or night. Wear them when exercising or para-sailing in the sunshine. Then, throw on some high heels and a shirt to hit the town! You'll be doing your body a favor and feel great doing it. Take care of yourself!